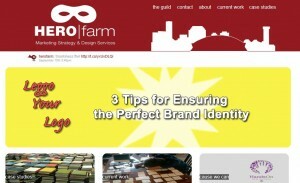 HERO|farm is a think tank with a new model in mind for the advertising industry. As a creative guild, this marketing agency’s simple philosophy is “Do great work for good people.” This includes doing some work pro-bono each year, and actively pursuing avenues of impact that create valued connections between people, places and brands while also initiating innovative ways to extend the positives of the human condition. Shaun Walker and Reid Stone of HERO|farm like to think that every story needs a hero and they are here to save the day. MO:Can you tell us about each of your backgrounds and how it led to the creation of HERO|farm? Born and raised in the Big Easy, Shaun returned to his hometown after Hurricane Katrina to help rebuild and be part of a defining generation. He amassed his student loan debt at the University of Southern Mississippi where he obtained an expensive piece of paper in the spring of 2006 declaring he had earned a degree in advertising. After interning at a local, large ad agency, he was hired to be a copywriter and worked there for two years, where he met future HERO|farm co-founder Reid Stone. Reid hails from right down the road to New Orleans in Pass Christian, Mississippi. An alumnus of Mississippi State University, the former Bulldog football player assumed post graduation job challenges in both New York and Panama before also becoming a part of the gritty generation to rebuild the Crescent City. For the next two years Reid worked at the same agency as Shaun, building up connections and experience that went far beyond what any other job elsewhere in the nation could offer. The advertising world is usually a good prognosticator to the health of the economy. And having worked in this industry for several years with Reid Stone, it had dawned upon us more than once that a great shift was on the horizon. When the market tripped and the axe fell in 2008 due to scared clients and shrinking budgets, our “what ifs” turned into “what nows?” Thankfully, we had pondered the idea of a new breed of advertising agency and, at this point, just had to find a way to make it a reality. It’s hard to take that initial leap of faith, but at the same time, when you’re pushed off the plank, it’s sink or swim. We first began working out of my new business partner’s house and used our connections to strengthen our new, fledgling business. We did not take out a loan to get started—using maybe a couple hundred dollars for simple things. Otherwise, we began building up from scratch in 2009 to become the 2011 Business of the Year, selected by the International Association of Business Communicators – New Orleans. We were truly lucky/blessed/charmed to have been surrounded by individuals who had been given the same unemployment death sentence. It’s with these individuals we formed our creative guild and with a few trusting (and now very happy…We think) clients that HERO|farm came to be – an agency based on creating opportunities out of unconventional thinking and maintaining a philanthropic side to keep us grounded. Some of our original teammates have grown with us and some have moved on to other opportunities, but all of them coupled with a “head first” attitude helped us to where we are today. MO:In an industry commonly criticized for a lack of good values, how do you differentiate yourself as truly working for extending the positives of the human condition? Business today, especially in this economy, is about collaboration—not competition. Not only do we want to do great work, but also do good for the world while doing it. A cornerstone of HERO|farm is to do at least one campaign per year pro bono for a non-profit, as well as work with clients who have admirable missions. In our third year, we have remained steady in that aim and will continue to do so each year moving forward. We don’t want to be the biggest or richest; we’re striving to be the most creative that makes the biggest positive impact on the world. We’ve come to realize how beneficial and impactful advertising can be for the viewer when it is paired with a client who has a good mission. When you add value to a person’s everyday life, you do more than just sell a product; you create a lasting relationship of goodwill and a connection that goes far beyond “sell-buy-consume.” Our goal is to help evolve advertising into something people don’t run from, but applaud. Simply, we just want to do our part in making the world a better place. As our latest commitment to this philosophy, we have been working with the New Orleans Mission, the city’s oldest public assistance provider to the homeless, to launch make a move, a free one-day, one-stop event that will provide struggling individuals from across Greater New Orleans the opportunity to get back on their feet through access to a broad range of services, including medical check-ups, eye screenings, foot care, legal services, employment assistance, food, toiletries and more. MO:Congrats on being named the 2011 Business of the Year by the International Association of Business Communicators – New Orleans. How does recognition such as this help HERO|farm accomplish the ultimate goal? Awards are funny things…We were truly honored to be named the 2011 Business of the Year, especially in only our third year of business. It lends credibility to what we do and gives that third-party validation that clients often look to as a reference. In that respect, it has helped us solidify some new business. The IABC is a phenomenal organization and it’s humbling to be given such an award by your peers. At the same time, you have to keep working and stay focused. An award can be a distraction if you’re not careful. You can lose your edge or that risk-taking mentality that got you to the podium in the first place. It falls on us to let people know that we received this award and to do so without gloating. In that respect, I think we’re new to that aspect and probably haven’t done as good of a job communicating our own success as we should. In an industry where agencies are the invisible ship that leads the mighty client Viking to profits, it’s our duty (if done well) to be invisible and with that comes the double-edged sword of case studies and award shows. They can raise or crush morale but they do have their place in recognizing agencies for the work that we do. A little advice, don’t get into any business for the awards or recognition. If you love what you do and take it seriously, they will come. MO:You mentioned that you will be featured in the upcoming book Coming of Age in a Crap Economy. So tell us about it, how has starting a business in this economy shaped the way you do business? LESSON 1: A whole new formula of elbow grease. If you don’t have the hunger, you’ll be hungry. The days of sitting back and collecting a heavy paycheck right out of MBA school are over. We knew when launching this business, and with any business, there was an inherent amount of work that comes with it. In our particular case, we had to become experts at everything that had to do with marketing and communications. So where we had dabbled in things such as media buying, B2B tactics, public relations, etc., the actual execution AND measurement (and doing it well) were a whole different story. Hello collaboration. We’ve worked with a number of agencies in different respects. For companies that may have been considered our competitors at one point are now our partners or may be asking for creative work (ghostwritten) to pitch as their own. A necessary skill is knowing what we’re good at and we know what others are much better at. The end result outweighs the highlights of a few…I sound like a Marxist, but in truth, the client doesn’t care that the copy was incredible if the layout wasn’t turned in on time. You get more done together, and often it’s better work produced. There are days when we wish we went to law school. An airtight agreement that lays out the scope of work, the “if this happens,” and the payment conditions is worth its weight in gold. It can make the client-agency relationship so much easier by letting each party know where they stand – And on what leg. I’m sure it has been this way for generations, but the days of the handshake are over. You must protect yourself and your company. MO:Tell us more about the Make a Move event in New Orleans to help reduce homelessness in the city. What has been your role in creating this event, and what are the goals of the event? New Orleans holds one of the worst homeless ratios in the nation. Since Hurricane Katrina, the homeless population in New Orleans has skyrocketed from 6,000 to about 17,000 people. make a move aims to combat stereotypes about the homeless and help dispel the stigma. As the recession continues, more families and individuals than ever are slipping into homelessness or teetering on the brink, living in cars and vans. make a move recognizes that the homeless are not all the same. They are our neighbors, and they are often women, children and babies. The goal of make a move is to re-engage our homeless neighbors with hospitality and direct resources, not just referrals. make a move will provide clothing, supplies, services like medical care, substance abuse and mental health counseling, and housing or shelter to those struggling individuals and families who are homeless or on the brink of homelessness. We hope to help thousands of people jump-start their lives in one day, on the spot, with access to a broad range of services all in one convenient location. In 2010, HERO|farm partnered with the New Orleans Mission as part of a pro bono project to updated the organization’s brand. Since that time the project has grown to include make a move. Based on the wildly successful Project Homeless Connect events in major cities across the nation, we believed New Orleans not only needed its own version, but also demanded one. At this point, we proposed the idea of partnering with the Mission to launch the first-of-its-kind event for New Orleans. They were thrilled with the idea and set us loose to begin setting it up. Through this partnership we are building a greater future for our city and hope to do a lot of good in one day for thousands of people who so desperately need it. MO:What can we expect in the future for HERO|farm? Hopefully you hear more about our clients in the near future than you do about us, which says we’re doing our job well. As for us, though…A bigger space? A London office? A working coffee machine? In addition to maintaining our philanthropic side, we had a few other goals that we set out to achieve. We are on our way but we’re not there yet. We’ve dabbled in starting a new business as a HERO|farm venture and may look at developing more ideas that push HERO|farm as its own brand. We’re big fans of Virgin – Richard Branson’s company – not the inexperienced individual. They’ve shaken up every category into which they’ve endeavored and usually for the better. Some of their ventures have not been as successful as others, and we have followed a similar path. Them’s the ropes. And we’re having a good time in the ring. Oh, and we’d like to upgrade the HERO|copter (check it out on flickr.com/herofarm) from the 5 inch model to the real thing.